Background: A custom jawline implant is a powerful augmentation method. 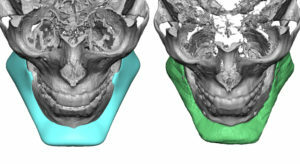 As it envelops the entire lower jaw from angle to angle its total external surface area coverage of the bone provides a true 3D change. While this augmentation effect can be impressive, its size also makes it the hardest facial implant to place. Through three small incisions around the chin and jaw angles, the implant must be placed in a partially blinded fashion. But more relevant is that the long length of the implant from chin to jaw angles on each side incurs the influence of trajectory. 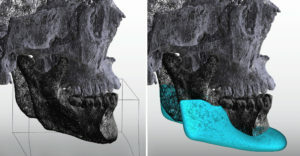 For example, if the horizontal axis of the chin section of the implant is slightly tilted, that effects the position of the jaw angles behind it to a much greater degree. The more minor deviation of the chin becomes magnified at the furtherest point from it. 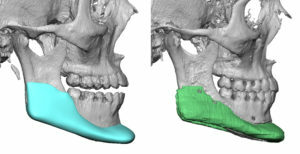 (jaw angles) This is a phenomenon that us paid a lot of attention to during surgery. But without clear visibility of all angles of the implant’s placement, such implant asymmetries are impossible to completely avoid. Case Study: This 35 year-old male has a large custom jawline implant designed and placed four months previously. He healed uneventfully without infection or wound healing problems. Most postoperative concerns about any type of facial implant asymmetry, provided enough recovery time has elapsed for all swelling to have resolved, are usually correct. But when the 3D CT scan fails to show such implant asymmetry, the other explanation is that the asymmetry is in the soft tissues. While a custom implant is designed to correct any bony asymmetries, it does not see or correct for any associated soft tissue ones. With the placement of the implant and the push of it on the overlying soft tissues, associated soft tissue discrepancies can become more apparent. 1) Custom jawline implants are the most challenging of all facial implants to place because of their size and surface area coverage. 2) When postoperative concerns develop about postoperative implant symmetry/placement, a 3D CT scan provides the definitive answer to those concerns. 3) The size of custom jawline implants can allow some preoperative and often unrecognized soft tissue asymmetries to become evident.